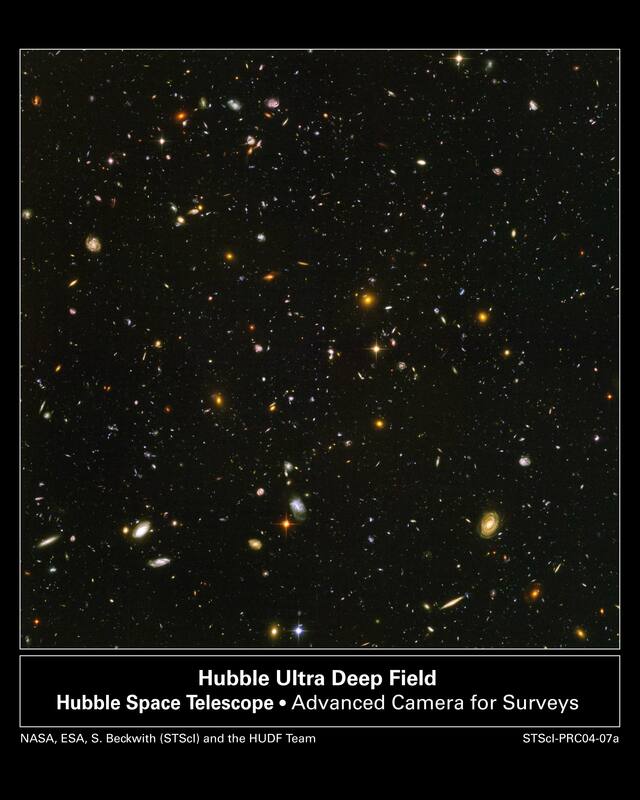 The Hubble Ultra Deep Field (HUDF) million-second-long exposure reveals the first galaxies to emerge from the so-called "dark ages", the time shortly after the big bang when the first stars reheated the cold, dark universe. How sharp is Hubble's resolution in pinpointing far-flung galaxies in the Ultra Deep Field? Hubble's keen vision (0.085 arc seconds.) is equivalent to standing at the U.S. Capitol and seeing the date on a quarter a mile away at the Washington monument. How many galaxies are in the image? The image yields a rich harvest of about 10,000 galaxies.